Flying your drone in the winter can be a challenging but rewarding experience. Here are a few tips to keep you flying in the cold and snow. Check your user manual for winter flight guidelines. Exceeding the recommended temperature guidelines could put your drone at risk. Be sure to dress appropriately for the colder temperatures. Wear warm clothing and be sure to invest in a decent pair of thin touchscreen gloves or a transmitter mitt. Keep batteries fully charged before each flight. Some drone batteries include technology that will automatically discharge battery power after a certain amount of inactivity. Make sure batteries are kept warm to preserve charge. If you’re going to be out in the cold for an extended period, you can keep your batteries warm by wrapping them up in a scarf, or a glove. Some pilots use hand warmers to ensure that they remain warm. Hover in flight for a minute or so. This will allow the battery to warm up prior to a long flight. 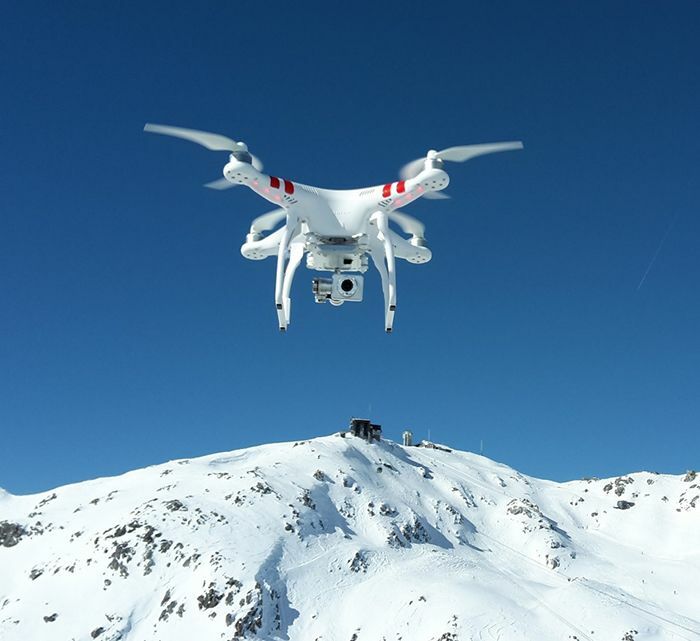 Set your drone for the correct exposure and white balance for your snow landscape shots. While you have an exposure meter on your camera, you may wish to set your exposure manually. Settings may differ depending on which camera you use. Be sure to read your user manual for the proper settings. If your drone camera allows for manual setting of white balance, set it to 6500K for an average snowy landscape on a sunny day. Turn it up if the snow appears too blue, or down if it appears too amber. If you’re shooting video, you will want to use Neutral Density (ND) filters. Bright winter environments force the fixed aperture cameras (typical on most consumer drones) to set the shutter speed too fast and turn your video into a jittery mess. Adding a Neutral Density filter helps limit the amount of light entering the camera, lets you choose slower shutter speeds, and helps you create smooth looking videos. Most drones aren’t waterproof and precipitation of any kind can damage the camera and gimbal, short out a motor, or cause other malfunctions to the drone or controller. If your drone does get caught in the rain or snow, land it as soon as possible. Make sure to dry off the props and body of the drone. In very cold weather, be aware that any moisture in the gimbal pads can freeze, which can impact the quality of your aerial footage. Get your Remote Pilot in Command Certification in order to use drones in commercial applications. New FAA rules make it easier than ever to become a drone pilot. This online course will prepare you for the FAA Remote Pilot in Command Certification Exam that you need to pass in order to fly your drone (sUAS) for commercial or business purposes. This course provides an overview of aviation weather that sUAS pilots will find useful when planning day-to-day operations. This entry was posted in Drones and tagged drone.